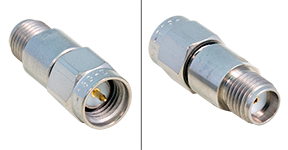 Midisco "SMA" attenuator. 1 dB. Gold. DC - 12.4 GHz. Normally sells for $42. 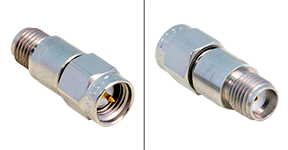 Midisco "SMA" attenuator. 2 dB. DC - 18 GHz. Stainless steel. Midwest Microwave RF attenuator. 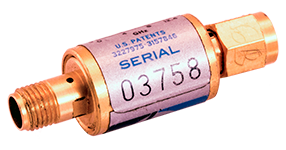 3 dB, 5 watts, DC-6 GHz. 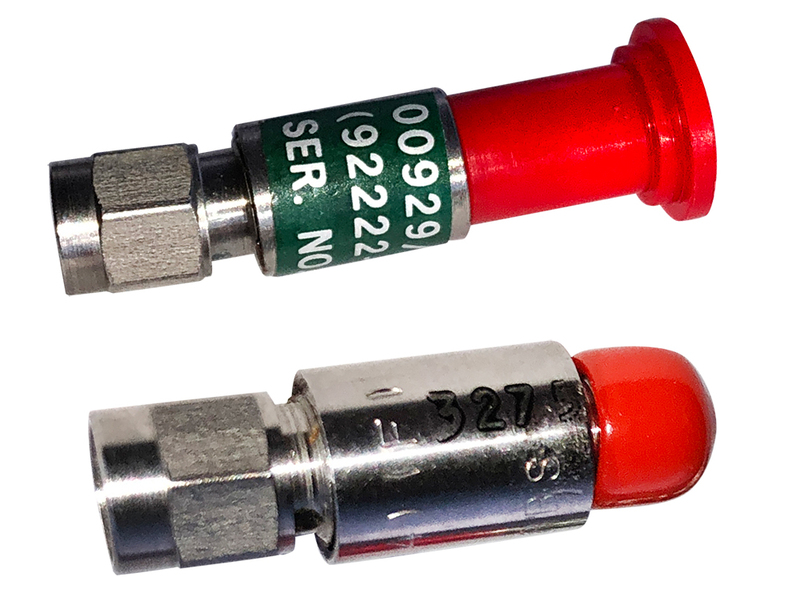 "SMA" male / female connectors. 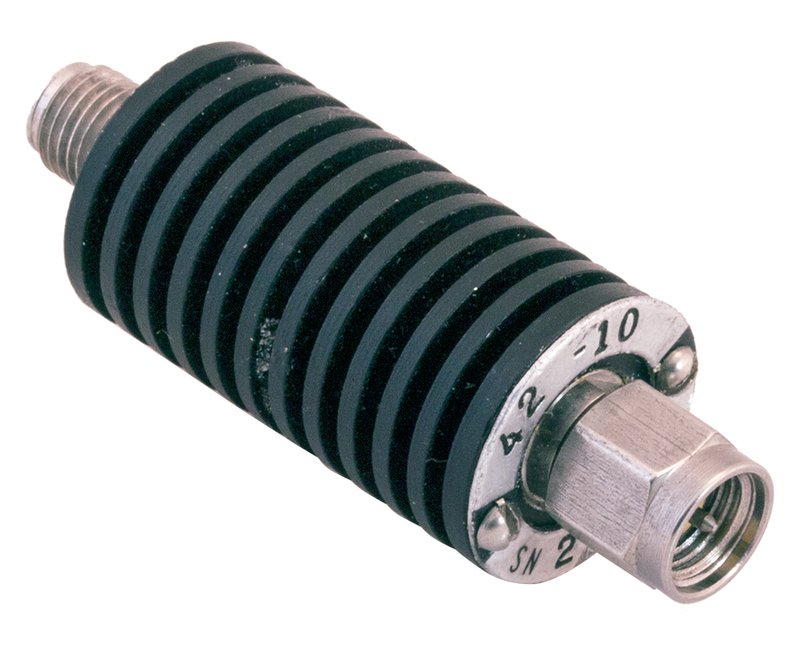 "SMA" attenuator. 3 dB. 2 watt. DC - 18 GHz. 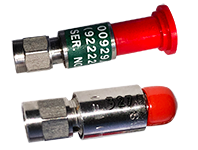 "SMA" attenuator. 3 dB, 2 watts, DC-12 GHz, 50 ohms. Alt. P/N: 00929/AH-A97. 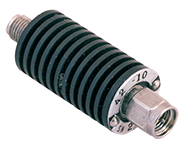 Midisco "SMA" attenuator. 4 dB. DC - 18 GHz. Stainless steel. RF attenuator. DC-12 GHz. 50 ohm, 1 watt. 7 dB. "SMA" male / female. "SMA" RF attenuator. 7 dB. Hewlett Packard RF attenuator. 10 dB, 2 watts, DC-12.4 GHz. 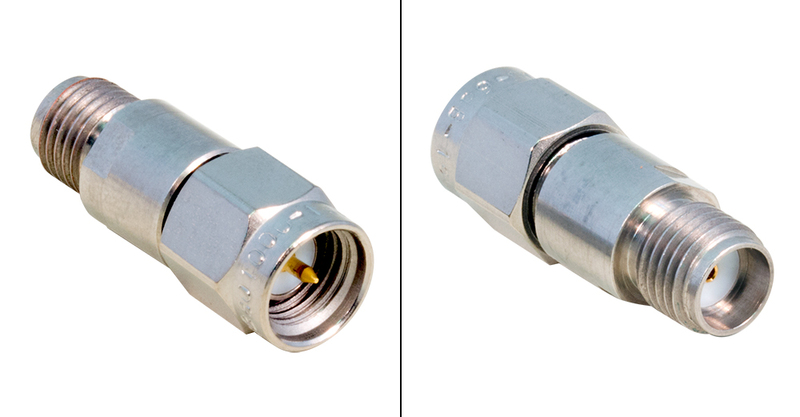 "SMA" male / female connectors. RF attenuator. DC-18 GHz, 10 dB, 2 watt. "SMA" male / female. 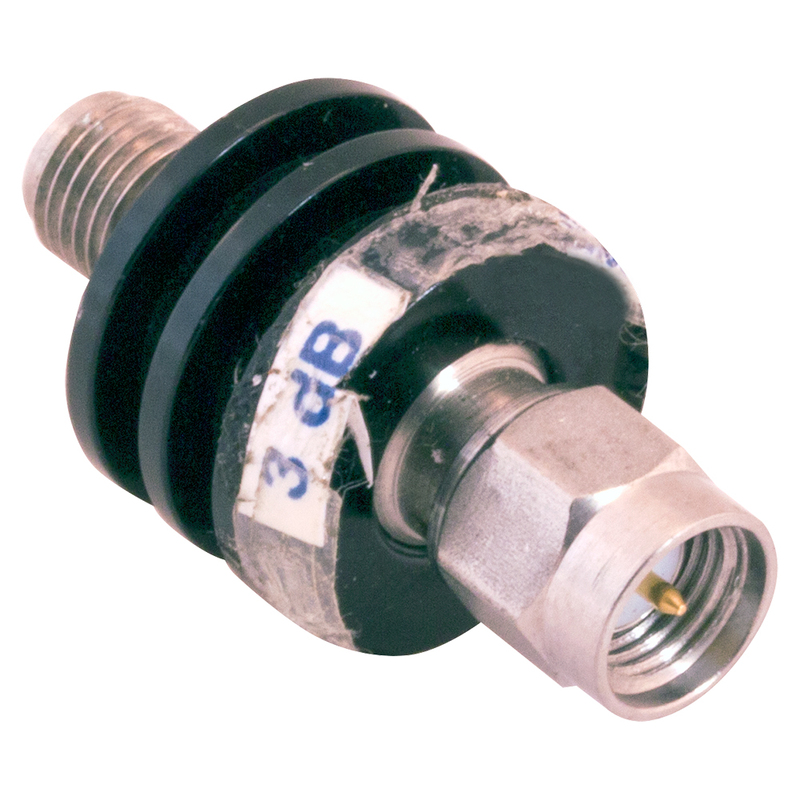 1-1/8" L.
Weinschel RF attenuator. 10 dB, 10 watts, DC-18 GHz. "SMA" male / female. RF attenuator. DC-18 GHz. 2 watt. 15 dB. "SMA" male / female. 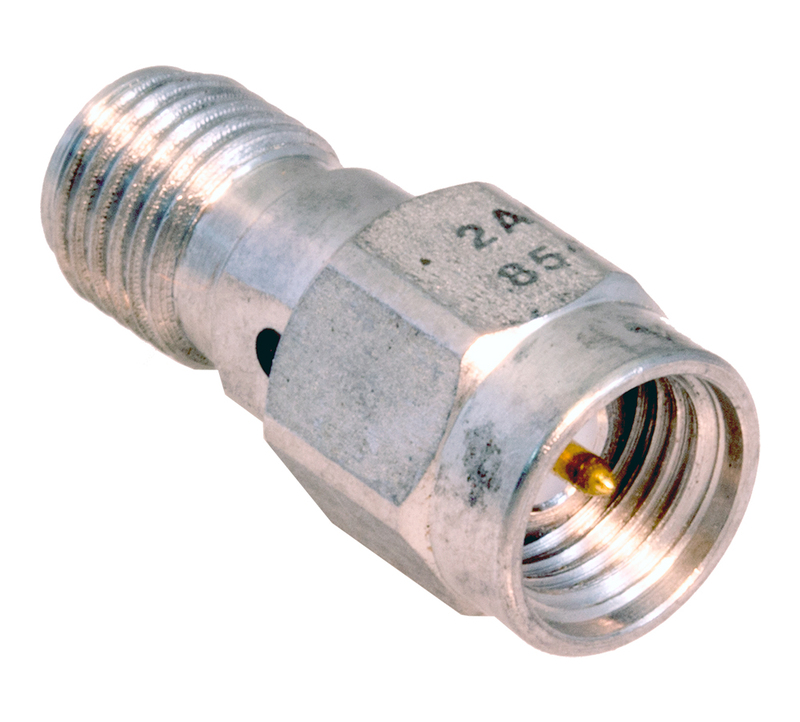 1-1/8" L.
Inmet RF attenuator. 6 GHz, 17 dB, 2 watt. 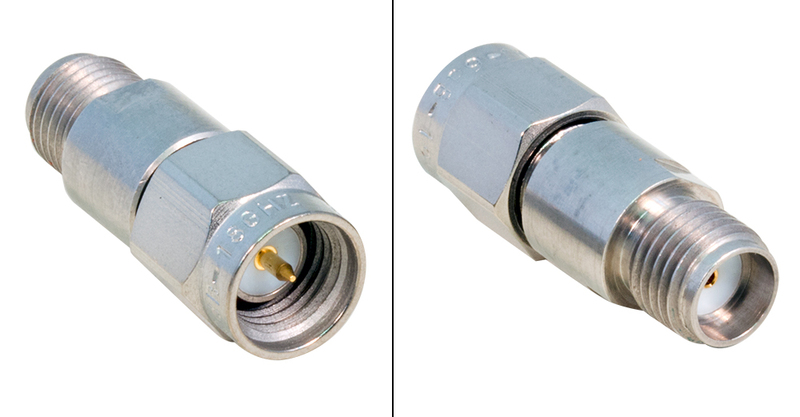 "SMA" male / female connectors. JFW RF attenuator. 20 dB, 50 ohms, DC-2.2 GHz. "SMA" male / female connectors. 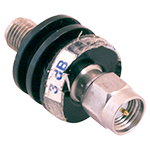 Inmet RF attenuator. 2.5 GHz, 10 dB, 1 watt. "SMA" male / female connectors. Inmet RF attenuator. DC-2.5 GHz, 6 dB, 1 watt. "SMA" male connectors. Attenuator. 1 dB, 5 GHz, 3 watt. "SMA" male / female connectors. Attenuator. 2 dB, 5 GHz. Gold plated. "SMA" male / female connectors. Inmet RF attenuator. 6 GHz, 14 dB, 2 watt. "SMA" male / female connectors. 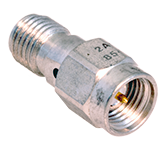 Aertech RF attenuator. 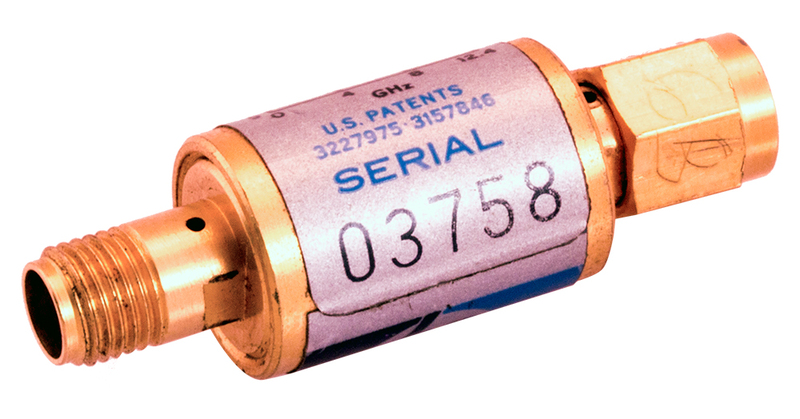 50 ohm, DC-8.5 GHz, 5 dB, 1 watt. 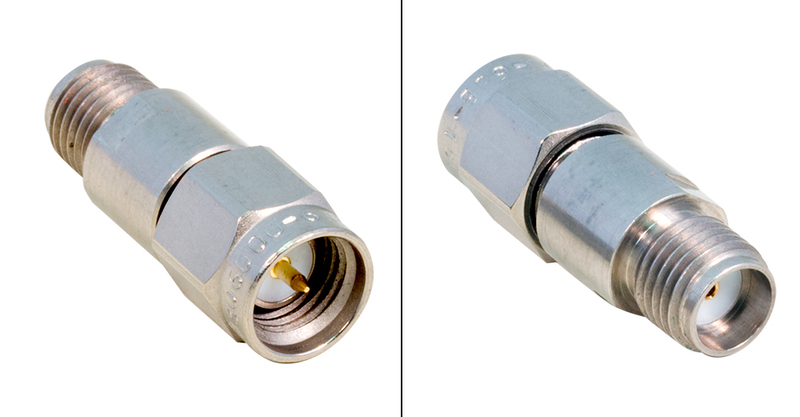 "SMA" male / female connectors. NSN: 5985-01-154-7343. 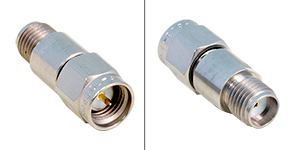 Radiall "SMA" Connector Attenuator 1 dB, 2 Watts, DC - 18 GHz, VSWR: 1.10:1 @ DC - 2 GHz, 1.15:1 @ 2 - 4 GHz, 1.2:1 @ 4 - 8 GHz, 1.25:1 @ 8 - 12.4 GHz, 1.35:1 @ 12.4 - 18 GHz, 0.35" dia x 0.86" L.
Radiall "SMA" Connector Attenuator 6 dB, 2 Watts, DC - 18 GHz, VSWR: 1.10:1 @ DC - 2 GHz, 1.15:1 @ 2 - 4 GHz, 1.2:1 @ 4 - 8 GHz, 1.25:1 @ 8 - 12.4 GHz, 1.35:1 @ 12.4 - 18 GHz, 0.35" dia x 0.86" L.
Radiall "SMA" Connector Attenuator 20 dB, 2 Watts, DC - 18 GHz, VSWR: 1.10:1 @ DC - 2 GHz, 1.15:1 @ 2 - 4 GHz, 1.2:1 @ 4 - 8 GHz, 1.25:1 @ 8 - 12.4 GHz, 1.35:1 @ 12.4 - 18 GHz, 0.35" dia x 0.86" L.